I've recently bought this asset pack, and it's excellent! There's an incredible amount of effort and detail put into it. I was wondering if you were able to add descriptions to the main tilemap, and maybe some of the others if possible? There are quite a few sprites that I have no clue what they are or how they animate. I've seen a few other asset packs that have data files that describe what each tile is, it's position and size. But I know that is a big ask for a tileset this size. However, I'm sure descriptions of the more mysterious tiles would be much appreciated. I completely understand if there isn't enough demand for a feature this. Thanks again for such a great asset pack! Can't say I'm waiting on anything in particular. I've been using your isometric tileset for my latest project and its been great. Some more tile variations would be nice, but it's a minimal tileset and the current selection of tiles is excellent. I have noticed there's no idle animations for basic characters holding different weapons, but I guess I can use the item images and 'attach' them them to the basic sprites. Looking forward to v0.2! What kind of content might you be adding? Excellent tilesets! I really love the style! I'm having some trouble getting the iso tiles working in Tiled2D. Could you provide some sprite dimensions/positions or perhaps a Tiled2D example file? Thank you very much! I'm glad you liked it! Hopefully I will add in some music and sound, it's the one area I thought the game was lacking in. I made this game as part of my final project for my Software Development apprenticeship. Your goal is to escape the maze with as much wealth as possible, walk over glittering items on the floor to pick them up. Throughout the maze, you will find creatures that want to steal your wealth. Each creature is defeated by a specific action, walk into a creature when the correct item is selected to perform that action. Games are quick, around 10 minutes long. 7DRL Challenge 2018 community » Community Discussion · Posted in Preparation question? Ah that's good to know. So it's not like the jam starts and only then are you allowed to start adding code to the project. 7DRL Challenge 2018 community » Community Discussion · Created a new topic Preparation question? I'll hopefully be participating in this years 7DRL, and I'm wondering how much preparation is allowed before the starting date? For context, I'll be using C# + Monogame along with engine code I've written over various different projects. How far are we allowed to prep the project before the 7DRL starts? For example, would I be able to get the user input, rendering and basic screen management code written and functional before the start date? Then once the challenge starts, work on the mechanics and gameplay of my entry. This is my first 7DRL and I don't want to break any rules before it's even started. I'm tried opening your save file but nothing I do on my system seems to work, I'm afraid I'm unable to submit your score. I've tried reverting to old code but it seems to be broken. Very sorry. Upload it to a file hosting site or dropbox and send me the link. That shouldn't happen. See if there is a folder called logs created in the same location as the game, there should be a crash log inside it. I think I've fixed the issue, try downloading v1.1.1. Thanks! I'll work on the balance and difficulty. I'm sorry to hear that, does it do this every time you try and make a new game? Is there a folder called log in the same location as the game? Mana is used by Spellbooks when enchanting equipment. Thanks, mrpete! I'm glad people are liking it! Thanks a lot! That's awesome. Make your way through the forest to rescue the king! Travel through procedural forests fighting monsters, collecting items and discovering spellbooks to enhance your weapons. 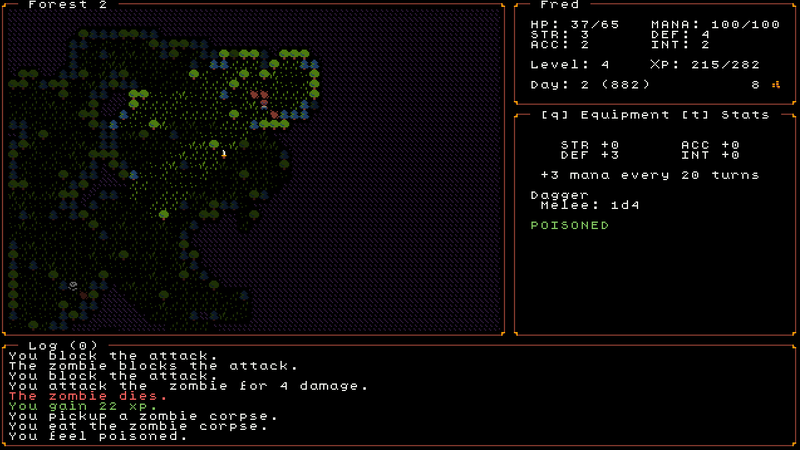 A Roguelike made for the /r/roguelikedev dev-along.